At Classic Ironworks, we supply and manufacture a wide range and style of gateways to suit all types of properties and budgets. As leading suppliers in the Bristol area, our team of manufacturers and installers can design and fit bespoke privacy gates, decorative, driveway, and entrance fencing for your property. We are committed to our customer satisfaction, and our bespoke fences are made to measure. Our personal touch is something you won’t find when you search elsewhere for gates UK. Our systems can be manufactured from a wide range of materials including timber, galvanised gates, steel, and wrought iron. It doesn’t matter if you are looking for farm gates, railings, garden gateways, or to make a bold statement with wrought iron double openers. We are confident that we can manufacture, supply, and install exactly what you are looking for. Wrought iron entrance gates will look stunning on your period property, systems manufactured from steel suiting a modern property to perfection. From kissing gateways to decorative railings, our team of dedicated experts can help you achieve the solution you are looking for. Our installation will heighten both the aesthetic appeal and security of your property. As leading wrought iron gating specialists, Classic Ironworks can provide everything you need. Wrought iron single gates, wrought iron side gating, wrought iron driveway fences, wrought iron double gating systems, and architectural ironwork for your home. A free consultation with our wrought iron specialists can help you make decisions on what entrance gates and outdoor fences to fit at your property. Our range of driveway and entrance gates are manufactured to the highest standard of workmanship. 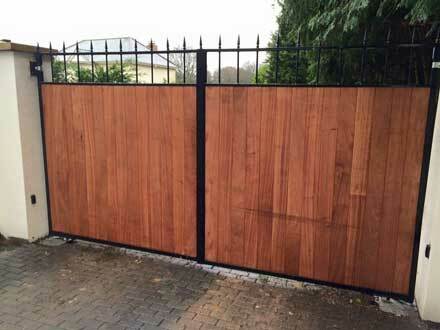 We have one of the largest selection of gate designs available in the UK. We are confident that we can supply you with what you are looking for without you having to make any compromises. Classic Ironworks can supply and fit gating and rails to virtually any type of property. Within our extensive portfolio you will find farm gate systems and garden railings. Choose from traditional wooden gating for your home, or from robust metal fences that are built to last. Our bespoke gates can be fitted as manual or automated. Sliding models are a popular choice amongst clients who have space-saving issues to contend with. Our entry fences and steel driveway gating systems will add security to your home, steel entrance gateways adding curb appeal and value to any modern home.